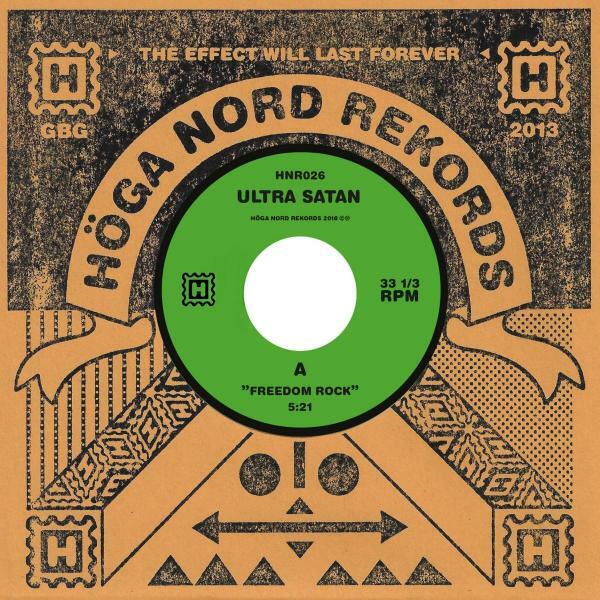 On Ultra Satans second 7inch release on Hoga Nord Rekords, the band is developing a new genre and concept: 'Freedom Rock', which is also the title on one of the tracks. 'Freedom Rock' is a step beyond 'World Music' which would be the wrong label when Ultra Satan sounds too spaced out and out of this world. On the second track 'Anti Clock', Ultra Satan hit strikes against the hysterical Swedish mortgage market, how safety destroys creativity and also against the worthless tokens of appreciation you receive from our corrupt and ultra capitalistic society. Ultra Satan is like a space being, living alone in an enormously big and empty space station, orbiting our planet. With mathematical precision this genius creates music that effects us earthlings on a transcendental plane and shakes the foundation we lead or lives upon.